I am a big fan and follower of David Lebovitz’s blog, David Lebovitz. David is an American living in Paris. He is a pastry chef, writer, culinary tour guide and food blogger. Well, I am sure you already know him. I really enjoy reading his blog. He just makes me laugh. While thumbing through my copy of David’s book “Ready for Dessert” I decided to recreate his chocolate port truffles for my family and you for Valentine’s day. 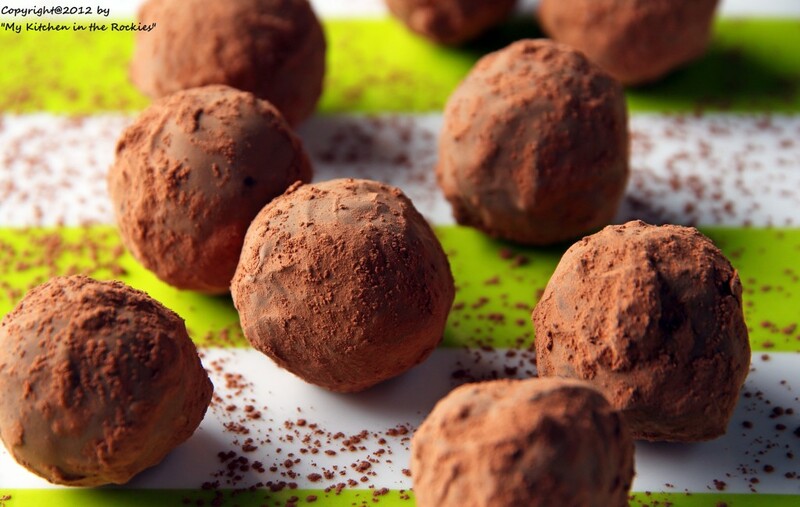 They are not your usual truffles, since David’s recipe enhances them with Port and coats the truffles with a thin outer chocolate layer that crunches when you take a bite. They get their finishing touch with a dusting of unsweetened cocoa powder, just perfect! David recommends not to skimp on the chocolate and to seek out the best you can find. Bring cream to a boil over medium heat in a smaller pot. Take from the heat and add 8 ounces (225 g) chopped chocolate. Let sit for about 1 minute. Stir chocolate cream with a smooth spatula until all the chocolate is melted. Add the port and butter. Stir until all ingredients are well combined. Pour mixture in a higher measuring vessel and blend with a stick blender until the ganache is shiny and smooth, about 1 minute. Avoid mixing in air! David mentions that you could also use a whisk or stand mixer, but again, don't mix in any air! Transfer ganache into a shallow container, cool, cover and refrigerate for at least 3 hours. Remove ganache from the fridge and form little balls with a melon baller or two teaspoons. I weighed mine to make them more even (each 10 g). Roll the ganache balls with your hands, not quite round, it adds some character. Place the ganache balls on a plate and refrigerate until firm, at least ½ hour. Place sifted cocoa into a shallow bowl with a rim. Melt 5 ounces of chocolate over a water bath. Remove ganache balls from the fridge. Now the fun starts! Pick up some melted chocolate with one hand, David recommends your dominant one (makes sense, right), place a ganache ball with your clean hand into the "chocolate hand" . 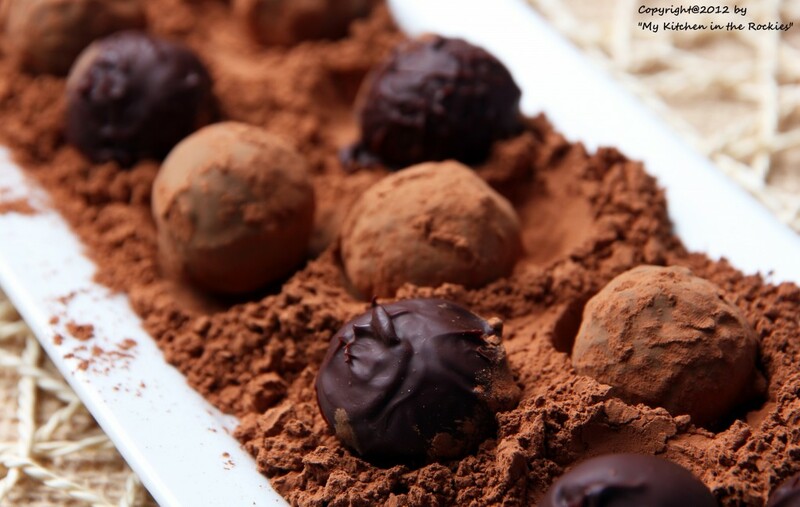 Coat the truffle with chocolate and drop it into the sifted cocoa. Repeat the process with all the truffle balls. 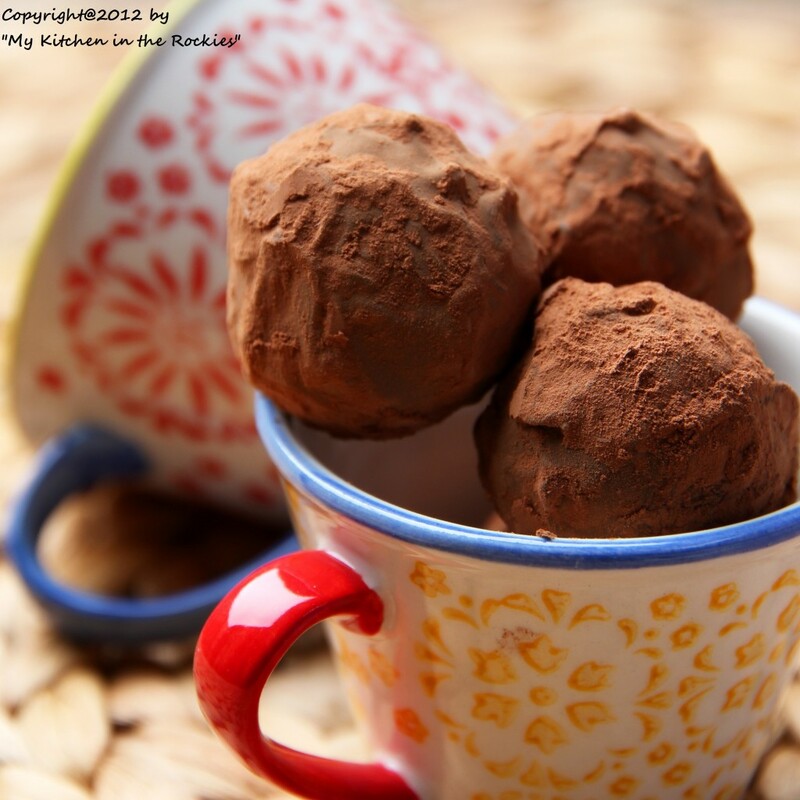 When done, jiggle the cocoa dish so that the truffle balls get completely covered with cocoa. Place truffles into a mesh strainer and move it gently to get rid of all the excess cocoa. David recommends to store the truffles in the fridge, but to remove them at least 1 hour before consumption. I personally like them cold, straight out of the fridge. Beautiful truffles. I like how they are covered with cocoa dust. Oh that extra layer of crunchy chocolate would be divine! These look Beautiful. Truffles are like crack to me… I’m trying not to look. Oh, those look divine…says the chocohalic that I am! Would love to add these to the desert table at our daughter’s wedding. Can they be made in advance and frozen? I’ve always thought it would be fun to make truffles. They are one of my favorite treats. Love that last photo with the cups Kirsten. Hope to see you soon. 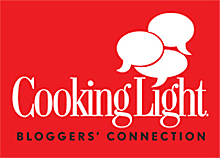 I am a big fan and follower of David Lebovitz’s blog & yours too! 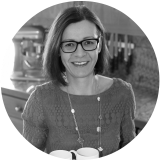 I learn a lot about the world we live in and enjoy the recipes with an international flair. BTW you are taking some beautiful pictures! How beautiful are these?! If you and David endorse them then they must be good. What a perfect Valentine’s recipe.